This type of rubber is usually very weak unless reinforcing fillers are incorporated. With suitable fillers, this becomes a strong rubber. It has similar chemical and physical properties like natural rubber. It has better abrasion resistance. It has poorer fatigue resistance. Heat resistance is better than natural rubber. Low temperature flexibility and tensile strength are less than that of natural rubber. This is the most widely used synthetic rubber. Demands for rubber increased sharply, when the automobile industry developed. Many trials were made to produce a artificial or man-made rubber. The first synthetic rubber could not match natural rubber, but in due course of time 14 other rubber types were developed, having properties comparable with natural rubber or even better. Styrene-butadiene rubber or SBR, the most common and cheapest type of synthetic rubber, is as an example of the manufacturing principles. This rubber is used in many of the same products as natural rubber. 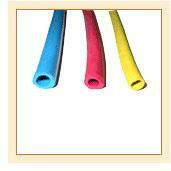 SBR is also used to cover different types of hose and in a number of other products. It is used in tyre and tyre products which also includes tread rubber and this accounts for 76% of global consumption. Other uses of SBR include mechanical goods, automotive, miscellaneous, including adhesives, floor tile and shoe soles etc. Adhesives and chewing gum have also been identified as two growing markets for styrene-butadiene applications.